I did not go to Hamvention this year. I apologize to those who expected to see me there, but the decision not to go was last minute and as a result, I did not post the news about my change of plans until Friday. Good news is that I missed the 2-hour wait in traffic trying to get to the new site in Xenia and I missed the swamp, which is what the flea market became after 3 inches of rain fell Friday and Saturday. Bad news is that I missed a lot of potential video presence over the weekend. A few booths down the aisle from my group's booth was a camera that streamed live video from the Hamvention throughout the weekend. 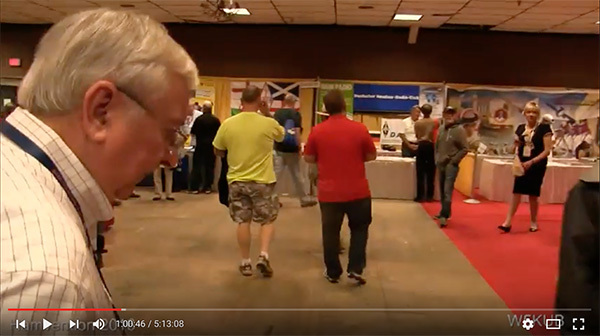 Quite often, the camera was pointed down the aisle at my group's booth, so if I had been present, you would have been able to clearly see me live and in person just as I was able to see all my ham radio friends who were staffing our booth. Hi Stana, would you share where this womanless pageant happened ? It was the 2010 Indian Super Queen pageant in Mumbai. Now I don't feel so bad about missing the Hamvention this year, Brenda!